I am not a huge fan of self-help books. It’s only once in a while that I pick up such books. 90 percent of the time I just leave them midway. I picked up ‘Confessions of a Serial Dieter’ on one of my regular trip to Crosswords. I had no book in my mind so I thought I’d give this one a read. This has been such a hyped book. And the more hyped a book is, the less I want to read it . I loveed the book. It is not a gyaan on what you should eat and what you should not. 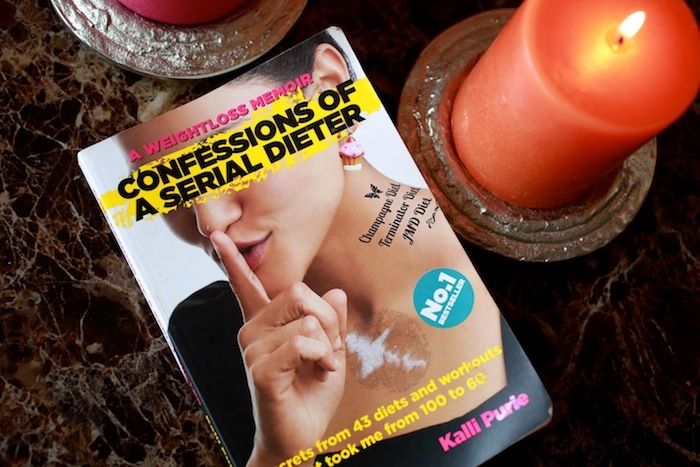 It’s Kalli’s ‘honest’ weight loss memoir from being 100 kgs to the super fit 56-57. She has already done some 43 diets and is still on a diet. 😛 It’s kinda funny at places but at one point of time I got a bit depressed reading her weight loss story. I got depressed because my own scale is not moving down by grams and she was talking about losing 5 kgs in 21 days. 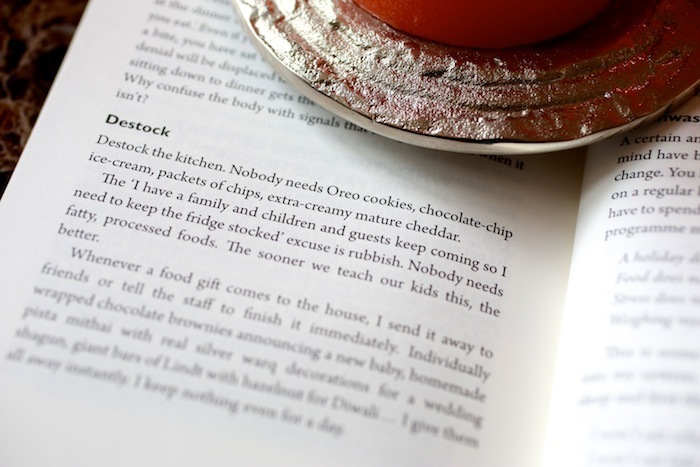 So you know..
Why I loved this book was more because I have been quite a dieter myself. I have been a cute chubby kid all my life. But during the growing up years being chubby is no fun. Plus if you have a super cook mom it does not help either. 😛 My mom would cook gajar ka halwa and rather than worrying about how much was in my huge bowl, I was more worried about how much was left in the kadai. My mom would warn me against my weight gain and I would ask her to stop being such an awesome cook. There came a time where I wanted to wear short skirts. My mom literally told me that my calf was the size of my thigh so I couldn’t wear short skirts. :| That hit my ego in a big way. After I finished high school, I did every possible thing to lose weight – crash dietings (living on water melons the whole day [my adorable dad wouldn’t let the stock of watermelons finish in our fridge], surviving on chanas and apples for weeks) etc , yoga, badminton , jhadoo-pohca. I lost 12 kgs then . What I got in return – lots of stretch marks, super hot body and hormonal imbalance. Anyway, it was only last year that I started taking fitness very seriously. One because I loved clothes and second, we lead a very stressful and busy life. I needed to be active and fit to cope with the stress. Somethings that I agree on what Kalli said in her book. I am sharing some of my personal experiences with all of you. A supportive someone : When you are in a process of losing weight, you need someone who would push you and keep you going. It could be a friend, husband or a your own mom. If you are about to eat something from the food heaven, STOP. You have been all disciplined and good about your work outs and foods, that one slice of oreo choc cake would show on your body. Don’t eat it. And if you still cant resist, eat a very small potion of it. Or keep a cheat day in a week for yourself. Indulge then. Destock your Pantry : Honestly, if I have chocolate, sugar cubes, a variety of cheese or cookies in my kitchen, I have to have them. And you know when you have them lying in your closet, you do want to do justice to the yummy goodness. Don’t you? 😛 So keep your pantry lean and healthy and you wouldn’t have less excuses on cheating. Keep a watch while eating out: You all know how much I love eating out. But when I am eating my sizzlers, I would skip most of the rice and potatoes on the plate. I would NOT have Indian food outside (except sarso da saag te makki di roti :P). It’s loaded with butter, ghee and a ton of masalas. Look for italian or mexican options. Ask the chef if he could change the pasta to whole wheat pasta or if he could reduce the sugar in your shake. I have not been paid to write this book’s review. I bought it myself. Also, dude keep doing whatever you're doing, you're looking fit and amazing lately! P.S. I saw Kalli's before and after pictures and her transformation is amazing. Very inspiring! Loved your review Rati! Theres so much to learn from this! I am definitely gonna buy it for myself. I’ve never been into dieting…it wasn’t needed much.But I always wanted to continue my Yoga and workouts…which I fail to do miserably.. I loouu dominos.. I can imagine it being the culprit. can’t blame you. loll!! Jomo.. My story is so similar to yours! I was skinny uptil my marriage. So much so that my mum asked a vendor to deliver a glass of mausambi juice at my home every single day at the time I was getting married. And Rati, loved the post. It was such an honest piece of writing. Emptying the pantry is a must thing for me and I am doing it right now! And Jomo is so right, you should write here more often. Really! Aww.. loved and smiled throughout ur post.. 🙂 such heart warming confession dear! My story runs in reverse gear though.. 😛 i was so lean n thin 45 kg till wedding, and i celebrated my 2nd anniversary wid 65 kgs.. 😛 ur post revives my dieting resolution.. 🙂 Definitely going to read this book!! parita all these fatty things in stock never help. If you have them at home, it is easier to eat them. but if you have to walk a while to pick the stuff up, 8/10 times you would just give up the idea. oh err… no english books. :(( you seriously need to find one. I also can relate to this.. inspired!!! i so am gonna take this seriously now…the thing that really struck me was being fit to keep up with the active & stressed life…i never thought of it like that…i’m ok-ok in terms of figure, just my luv-handles & tummy bother me loads..i do avoid rice & junk as much as i can..eat a healthy breakfast, include fruits in my diet etc…but wat m not serious about is working out strictly..& lately i have been so tired!! i come home & i have strength to do nothing! i was thinkin wat is wrong with me, now i know it’s coz my body needs to b pushed into getting used to being active..! great post..loved the way u wrote this, couldn’t stop smilin & said “awww” at multiple places 🙂 i avoid fitness blog of imbb coz i know i’ll b dead guilty if i read it but now i will make myself not b so lazy about it! Same story …. Mom makes delicious food and says ” kha le beta , yehi din hai khaneke” :(. I’ve hired dietitian but all my efforts go in vain 🙁 . thank you neha. good luck with your weight loss. mwwwaahhh!! you write so well Rati…and i can totally relate to your life story,mine is a similar one. OMG!! I love this book. My heart goes out to Kallie. I have re-read this so many times!! I always think that only someone who has gone through weight issues can understand another’s mind, what we think/feel when we put on weight, etc. Bcoz it is such an emotional journey. aawww!! thank you ramya. :)) i agree with what you said… you can never be too thin. loll!! anshika, you may check nicholas sparks books. this was thefirst book which motivated me a lot towards weight loss, before reading this book i used to go on bland diets , used to get bore and was back to binging . and by the way maam you review books as nicely as you review cosmetics so please review some more books in detail. this is one of the best books i have read in recent years. makes me believe tht love can wonders in ur life 🙂 the love of ur husband/boyfriend, mom, dad, sister, children… without their support, its really difficult ro lose weight happily! wow.. it was a nice read Rati…..
imbb never lets us put down our fitness resolves. but these winter times are so testing! even if i hit the gym at 10 instead of 5 i am not able to get the same drive to doi the workout! posts such as these will keep me going for a week! and of course I have misfit cokming to my rescure every now and then! Kalli was our client in my previous organization (we were designing their office). Her dedication to her diet is amazing! She said she survived on nariyal pani for weeks. Ofcourse that isnt for everyone but i can never imagine doing that! First of all Thank you Rati for putting up the post here.. it means a lot to all women and its quite an inspiration for someone like me who gets to hear in one way or the other for short height, dark complexion and the extra weight is an added baggage. Aww so sweet this one – “My mom would cook gajar ka halwa and rather than worrying about how much was in my huge bowl, I was more worried about how much was left in the kadai. ” This is a very accurate and helpful post.